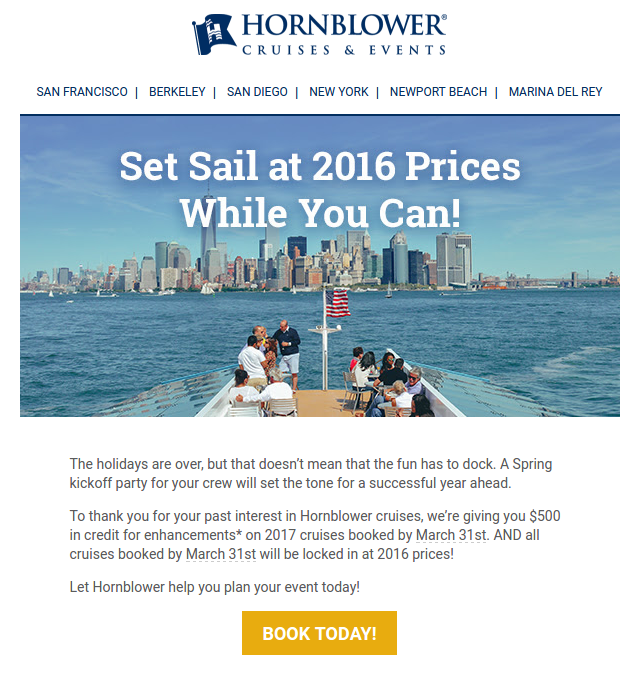 Spring 2017 Rebook NYC - Enjoy 2016 rates before they sail away! New year, new plans! Get a head start on the year while planning your annual events. Spring launches, summer shindigs and holiday galas are better on a yacht! Forget the stress of figuring out how to get home. With UberEvents there's no need to worry about parking, hailing a cab, or catching a ride for yourself and your guests–you can plan everything beforehand with a simple custom code. Planning the company holiday party can be overwhelming. Venue, theme, food, music - so many things to consider to create that memorable year-end celebration. It’s not too late to plan your holiday party. We still have prime dates available. Hornblower’s party-planning elves will take care of everything from venue to drinks, menu, entertainment, and more.